Grace and peace to you from God our Creator and our Lord and Savior Jesus who is the Christ; will y’all pray with me? May the words of my mouth and the meditations of all our hearts be acceptable in your sight O Lord, our rock and our redeemer; amen! So, we continue our journey and venture through this season of Lent. This is the second week of this penitential season and I’m still living into this season in a place of joy. Last Sunday – the first week of Lent – we experienced that joy in the presence of God with us in and through our wilderness moments and times of temptation. The joy that God and God’s love is with us always – already – not after we ‘persevere’ through the tough times. This Sunday, we hear and read of Jesus lamenting and praying for Jerusalem. The city of God that, more often than not, has persecuted the ones called to point the people of faith back towards God and God’s love. This text begins with the usual ‘foils’ to Jesus’ ministry. The ones who consistently test him, mock him, and clutch their pearls about what he does. This morning we hear and read of the Pharisees who warn him in our text today. They have concern for him. They inform him of King Herod’s desire to end his life if he continues his ways and even begins approaching the Holy City on a Hill. Yet, they come from the same stock that rejects not only Jesus’ teachings, but the teachings of many of the prophets of old. It’s quite a dichotomy isn’t it? One would think that Jesus’ response to the Pharisees – even these Pharisees concerned with his well-being – would be apathy, perhaps even anger because of how they constantly try to trap him, sway the views of those around him, and thwart his ministry at every opportunity. Yet, that isn’t Jesus’ response. He laments. He prays for. He continues to reach out to them. To reach out to the ones who are so obstinate and stubborn in their views towards him and God’s love and ministry. Think about the ones who twist and distort God’s word to mean something different, something vile, something so full of hate and violence you wonder that you might not be reading the same book. We saw that on display this weekend as one who upholds the sinful and sin-filled views of white supremacy, Islamophobia, and bigotry slaughtered 49 individuals peacefully praying in their mosque in Christchurch, New Zealand. Think of all those people in life who try to stop you from getting where you desire to go. The ones who try to stop you from proclaiming Jesus’ love and God’s presence to all. Think of all those who focus on the small(ish) and possibly inconsequential things while you’re trying to proclaim radical acceptance and grace? How do you truly feel about them? If you didn’t have those certain folks standing in your proverbial ‘way’ how much more could you accomplish? How much more fulfilling would that work be? How much less stressed would life be? It’d probably be pretty good. So, our tendency is to dismiss those who disagree with us, push them to the side, and become angry at them. Giving them up to the ‘fox’ who is so eager to twist, mutate, and fill with anger. For how does a fox – or any predator – usually work? By picking off the weakest prey or the one wandering off away from the group. Recently, I finished watching the Netflix documentary, “Behind the Curve,” which explores the lives and beliefs of those who incorrectly believe that the Earth is flat. No matter the mounting evidence of pictures, videos, experiments, and more that prove that we live on a globe and not a flat plane; there are still those who are obstinate in their views. The first reaction is to just dismiss them as misguided, irrational, and more. To be mean and possibly hurtful to them because of their views. I think we all can fall into that tempting trap of the fox as well. Yet, there was one part of the documentary that touched me. It was a moment when two physicists, Lamar Glover and Dr. Spiros Michalakis, when they talked about how we do a disservice in trying to ‘shame’ people into believing what is truth. Where we push those who we disagree with to the fringe of society and we ‘lose’ them. Lamar Glover, mentioned in a speech to colleagues that ‘when we leave people behind, we leave bright minds to mutate and stagnate; these folks could be potential scientists gone completely wrong. Their natural inquisitiveness and rejection of norms can be beneficial to science if they were more scientifically literate.’ Dr. Michalakis and Lamar ask their colleagues and each of those who know this truth of a round earth, to gently walk with those in love and care to show them the better way. I remembered that part of the documentary when Jesus in our Gospel reading today laments over the children of Jerusalem and states about his wish to gather them as a mother hen gathers her brood under her wings. That’s the opposite way in which we want to and usually react towards people who are ‘against’ us in some way. None of us – none of us – would fault Jesus for throwing the Pharisees and those who agreed with them to the side, pushing them to the fringe of society and life because what they believed was ‘true’ was so far from the truth. Yet, in spite of the obstacles that many against Jesus placed in his path – the questions, the ‘traps, the rumors of harm, all of it – in spite of it all Jesus boldly faced towards Jerusalem. Jesus boldly faced and marched towards the city because of his love for them. Oh, how Jesus desires and does gather creation under him as a mother hen gathers her chicks. I saw a video of a mother hen protecting her chicks this week, and one thing really struck me in one of them. First off, hens aren’t really that big. Sure, there are some bigger than others, but for the most part, they aren’t big birds at all. So, I was surprised that as a farmer was trying to coax a hen to stand up to show him her chicks, I assumed there would be only three or so chicks under her. I was amazed that when she stood up there were nine to ten chicks gathered under her body and wings. How’d they all fit in there! How could she possibly protect all of them with her body! It was fascinating. To know how out of love, boldness, and courage this hen would protect her brood against a sly predator of a fox. That got me thinking a bit more about Jesus and his desire to gather God’s children – all of us – under those wings of love and care. Jesus is saying that he too is like a mother, wishing to care and nurture and protect those under his charge. In love he is willing and determined to sacrifice himself for the ones he loves. Just as that hen will for her chicks. Jesus is the momma who will love you through and through and protect you even to her own death. The joy of Lent that we get to know this week is that there is nothing that keeps Jesus’ love from you. There is nothing you can do to stop Jesus from protecting you, caring for you, nurturing you, gathering you under his arms of life, from laying down his life for you. 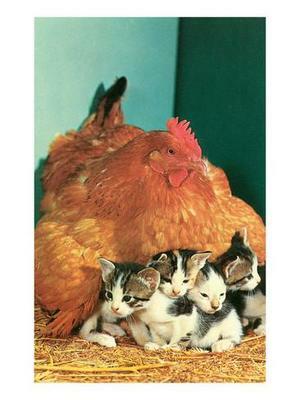 Just as a mother hen protects her chicks. Jesus doesn’t shame people into believing in him. Jesus doesn’t kick out those who don’t see God’s love in his work. He continues to perform cures today, tomorrow, and the next. He continues to reach out and love. He continues to boldly march towards the cross for all. He continues to confront hate and violence and rumors of harm with love, care, and God’s redeeming Word for the whole world. We too can learn from that example. Where in our frustrations – even during this season of Lent – we pray for Jesus’ guidance and strength to love as he loves. To care as he cares. To share the gospel as he calls us to share it. With everyone. In love. In care. Not in shame. Not in ridicule. And not casting out those who disagree with us. Stating the truth in love and grace towards those who – for whatever reason – are blind to its light. We continue to walk, to love, to guide, to call upon God’s love to rest in our hearts so that we can walk with others, and that others can walk with us – even when we are obstinate and stand in the way of God’s love for all. That’s the joy of Lent. Amen.